Talk about off the beaten track! This place is nearly impossible to find, but once you get there it is cosy and clean and full of lovely Mums and Dads. 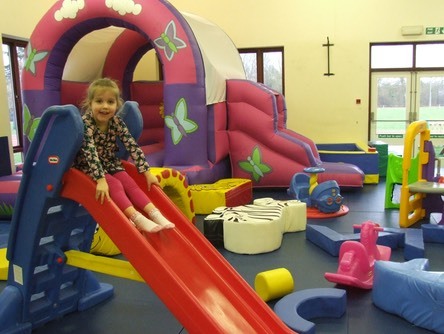 There are all sorts of soft slides and little play houses, a bouncy castle, ride-on toys and a ball pit to explore. It's not showy, just colourful and practical, and the toddlers love it! Plus, all the mums there seem to friendly and welcome new mums. You will want to come back as much as your children! Refreshments: Kids’ lunch box (sandwich, crisps, fruit, smoothie) �2.50. Best thing: It feels safe and its so friendly! They will heat baby food/milk. Worst thing: Hard to find... but once you know you'll be prepared next time. Admission: Under 1's �1.00, Over 1's �3.50 and additional Siblings �2.50; Adults free.